Thank you! I loved working on it! This is the second year the Village of Coxsackie and the What a Hoot committee have done the project, so I got involved by following the project the first year and connecting with the committee afterwards. Catskill has just completed their 12th year of the Cat-N-Around Catskill fundraiser, a nearly identical project (except with cat forms), which I’ve participated with a few times, so I was thrilled when my hometown initiated the project for themselves. For anyone interested in participating in one of these fundraisers or attending the auction(s), it’s a lot of fun, and I certainly recommend it. The owl auction is coming up soon at the Coxsackie Yacht Club on October 13, 2018. 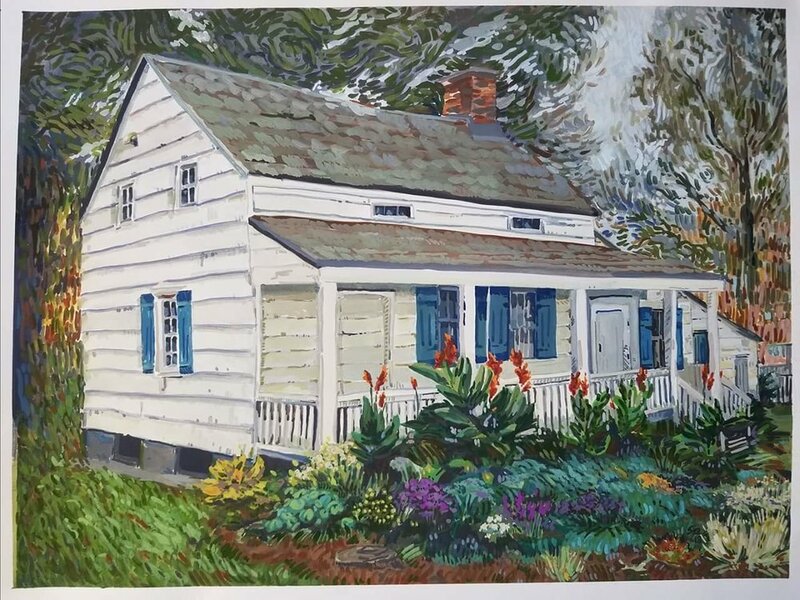 BKDW: I also love the homes that you paint, and I bet a lot my city-based readers would love to have paintings of their country homes. Do you do commissioned work? Yes, I do! People can contact me through my website (www.sarapruiksma.com) and I’d be more than happy to discuss a custom house portrait. The paintings make great gifts and all I really need is a good photograph for reference. BKDW: Your new works seems to use some of the the botanical elements that adorn your your owl, and they also echo your house portraits. Can you tell us about your upcoming solo show in Troy? I’ll be exhibiting an entirely new series of works in Place, an exhibition in the Wallace and Foyer galleries at the Art Center of the Capital Region. The series began more than a year ago with house portraits and evolved into more sculptural paintings combining my long-standing admiration for botanical elements. The new works and the sculptural components are uncharted territory for me which is exciting. As part of the exhibit, I’ll be doing an artist talk at the Art Center on Thursday, November 8th at 7pm. The exhibition runs October 19-November 18, 2018 and there is a free, public reception on Friday, October 26th 5-9pm, during Troy Night Out (which is a whole other fabulous thing in itself!). The Art Center of the Capital Region is located at 265 River Street in Troy, NY. BKDW: I love that you’re showing your work in Troy. We visited for the first time and fell in love with the amazing coffee bar Superior Merchandise. I can’t wait to go back! You mentioned that your Great Adorned Owl was a hometown project. Where did you grow up, and where do you live now? I grew up in Coxsackie-Athens and settled down about 20 minutes north in a similar small town. I lived in western NY for a few years during undergraduate school, and lived in Albany during graduate school, but I prefer the small towns our region has to offer. There’s more space to stretch, you know? BKDW: Yes, I totally understand the draw to a smaller town. For any of our readers who are thinking about moving upstate, why did you choose your particular town, and what are some of the perks of living there? My husband and I chose our town largely for commuting purposes, but particularly for the house we fell in love with (a late 1800’s Italianate style house near the Hudson River) and well, the small-town vibe. Having dog-friendly parks nearby was important for us, (Joralemon Park is a favorite of ours) and having a TrueValue hardware store in town is a huge bonus. Our families are nearby too, so we’re right in the middle of everything we need and love. Our “go-to” breakfast and late dinner picks are Trackside Pizza & More, and the Silver Spoon diner in Ravena. Getting take-out is especially helpful when I’m in the studio, and grocery shopping has fallen to the wayside. BKDW: Yes, access to take-out is key for busy people! I just reread your bio on your website, and it looks like you have so many jobs! Which projects are you most excited about at the moment? And is your life set up so that you're able to make art every day? 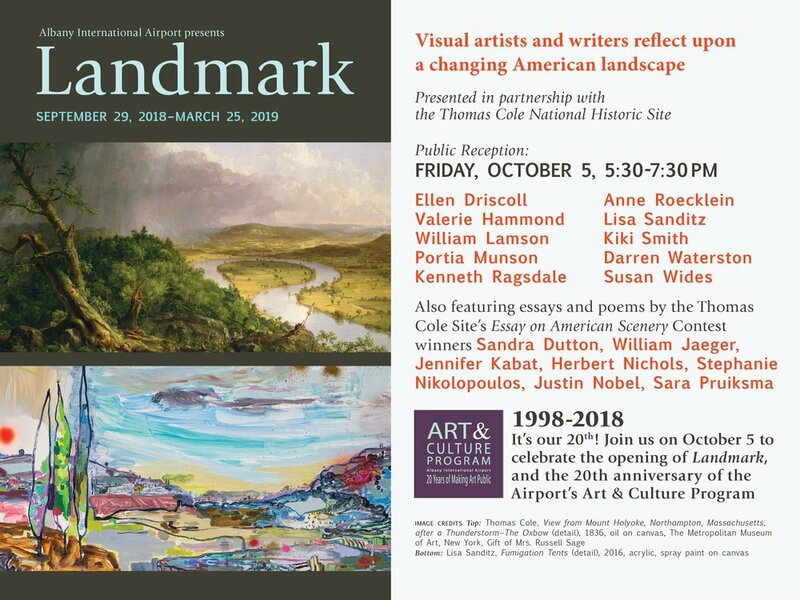 Well, at the Albany International Airport, I work as the Curatorial Assistant in the Art & Culture Program, and we’ve just completed out latest exhibition Landmark, a partnership with the Thomas Cole National Historic Site. The exhibit features ten artists and seven writers reflecting on a changing American landscape, and actually, I’m really excited to be one of the writers! I submitted to the TCNHS Essay on American Scenery Contest earlier in the year, and my poem A Note to Those Sighted, By A Loving Daughter was selected as a winning entry by a panel of jurors and subsequently is included in the exhibit! The poem serves as a heartfelt message to those able to physically see our beautiful landscape, and not take it for granted. I’m grateful to be able to share it with a wider audience through this opportunity. At May + Watkins Design we’re working on several projects around the country (all exciting and different), but, in particular, I am working on two mosaic pieces (sited for a public park in Virginia later this year) and that’s been a great deal of fun for me. I’m also really excited for the Art School of Columbia County. I’ve taught there for a few years now (my next class is Saturday, November 3), and they are raising monies to secure the donation of their historic schoolhouse as their permanent building. They have currently raised 40% of their goal and have $12,000 left to raise by December 31st, 2018. I’m hopeful for the Art School; their mission and staff are well deserving of the support necessary to meet their goal. The building itself (a bright sea-foam, aqua green, surrounded with gardens) has become a part of the art school, it’s become an icon and beacon for the arts in a rural, largely underserved population. I don’t get into the studio every day, but I can get in there a few nights during the week, and on weekends. My husband Michael is also really supportive, so he’ll help out more around the house and so on to allow me more studio time. I’m very fortunate that way. I also think there’s many ways to make “art” and simply being creative or thinking about your work can be just as productive as actual studio time. At the very least, I do that everyday. BKDW: That’s such a great mindset. You know, it seems like a lot of artists and makers live in the Catskills, but (at least from my Brooklyn perspective, where we all live on top of one another) everyone seems so spread out geographically when you get upstate. Do you feel like you're a part of a larger artistic community? Yes, I totally do. Even though our artist communities are spread out geographically, we’re connected by local art centers, universities, galleries, museums and residency programs. After leaving graduate school I felt a huge loss of community, but it didn’t disappear, it just changed. It simply took time to adjust to what that new sense of community was. Our arts scene in the upper Hudson-Valley through Albany and to Saratoga is thriving. It’s great to be a part of it. Thank you, Sara! If you’re near the Troy/Albany area, you can check out Sara’s artist talk at the Art Center of the Capital Region on Thursday, November 8th at 7pm. Her work will be on display from October 19 through November 18, 2018 and there is a free, public reception on Friday, October 26, from 5 to 9pm, during Troy Night Out. The Art Center of the Capital Region is located at 265 River Street in Troy, NY.